ENRICH - Vampirella #106 large magazine painting, Vampy threatened by...the Wicked Witch of the West? GONZALEZ, JOSE - Vampirella #75 pg 1, introducing the title character, the "Blob Beast", a cannibal alien trapped on Earth and forced to become a movie producer! Scary!!! GONZALEZ, JOSE - Vampirella #75 pg 11, Vampy breaks out her super-sucking power, and Pantha, to defeat the villainess! 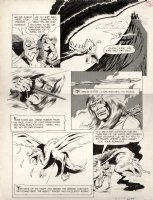 GONZALEZ, JOSE - Vampirella #75 pg 2, Holy Frank Frazetta! look at the art on this Vampirella splash panel! Hubba, hubba!!!! GONZALEZ, JOSE - Vampirella #75 pg 4, splash page. Oh, No! Vampy threatened by the cannibal blob beast from outer space!!! GONZALEZ, JOSE - Vampirella #75 pg 6, Vampy's monster costar finds her acting skills…delicious! GONZALEZ, JOSE - Vampirella #75 pg 7, Vampy is shocked to hear Pantha described as the one with "the body"? HAESER, KEN - Li'L Vampi #1 cover, Vampi builds a...snowman? MAYO, GONZALO - Vampirella #73 pg 32, Vampy battles insane half-naked blonde she-devil…cool stuff, eh? SMALL JR, LOUIS - Vampirella Strikes Annual #1, Vampy, in her class costume, has just enjoyed a little snack!